Artist Trading Cards (ATCs) are so much fun to trade and collect, but sometimes it’s hard to know the best way to store or display them. qazicat came up with a delightfully ghoulish way to keep her special Halloween ATCs together: she used foam core, tissue paper and sheet music to create this amazing Haunted House ATC holder. 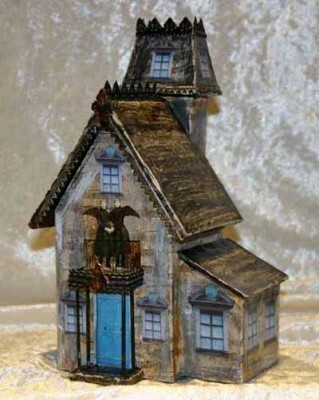 This haunted little house is beautiful on its own (I love the creepy sisters standing on the balcony! ), but when you lift the lid, there is storage for several of her Halloween ATCs. What a great idea for Halloween decor, even if you don’t have ATCs to store!